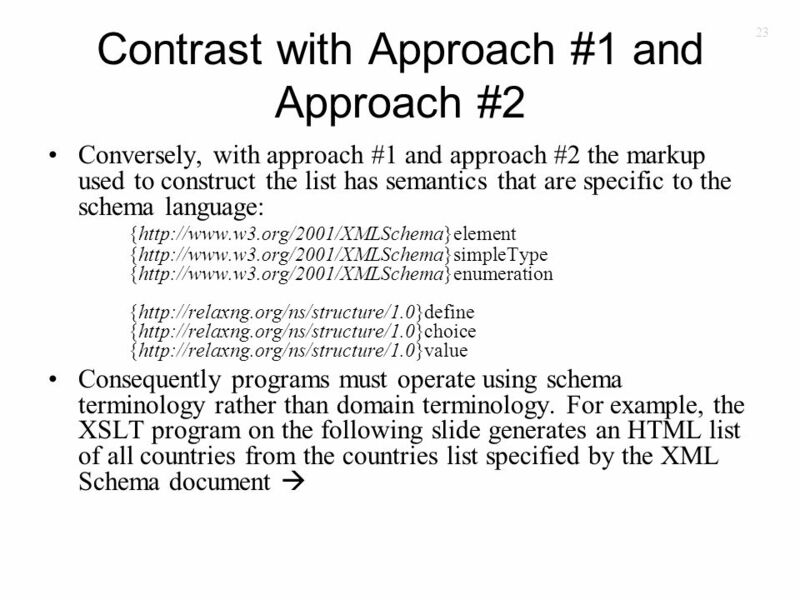 1 4 Approaches to Structuring Lists February 22, 2009. 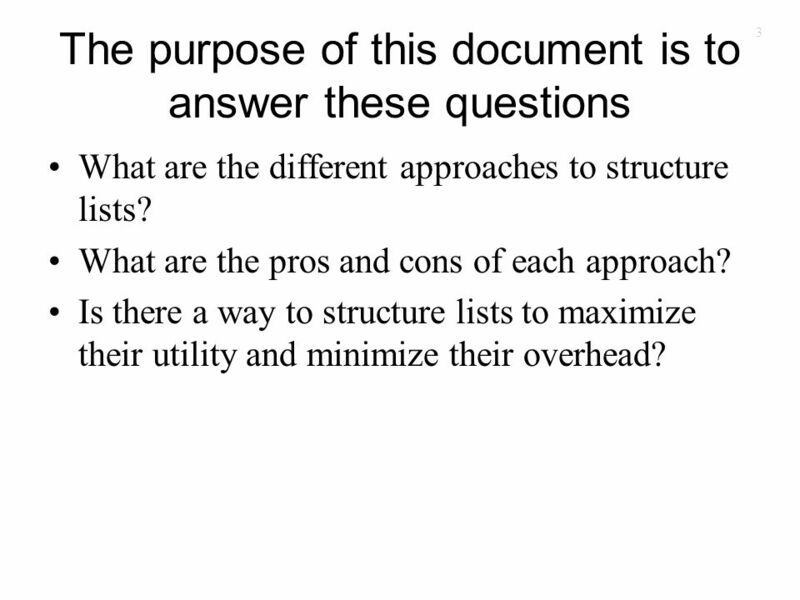 3 3 The purpose of this document is to answer these questions What are the different approaches to structure lists? 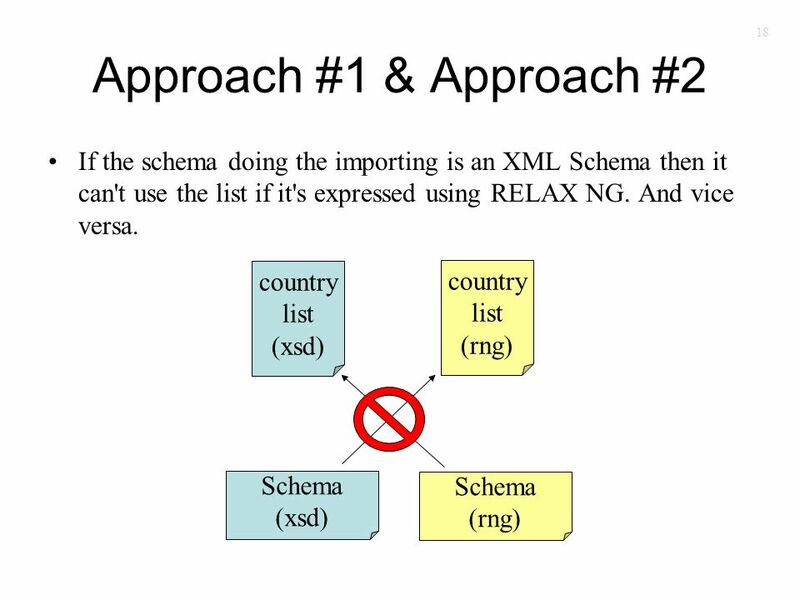 What are the pros and cons of each approach? 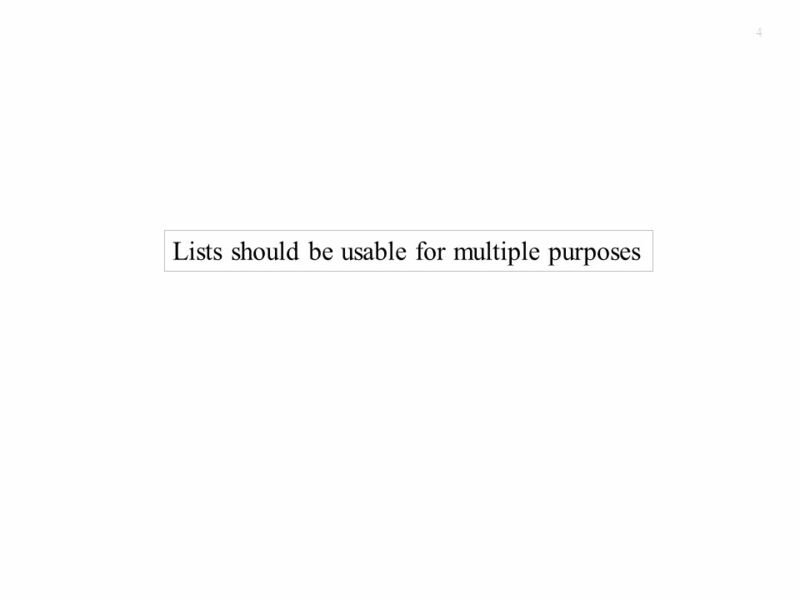 Is there a way to structure lists to maximize their utility and minimize their overhead? 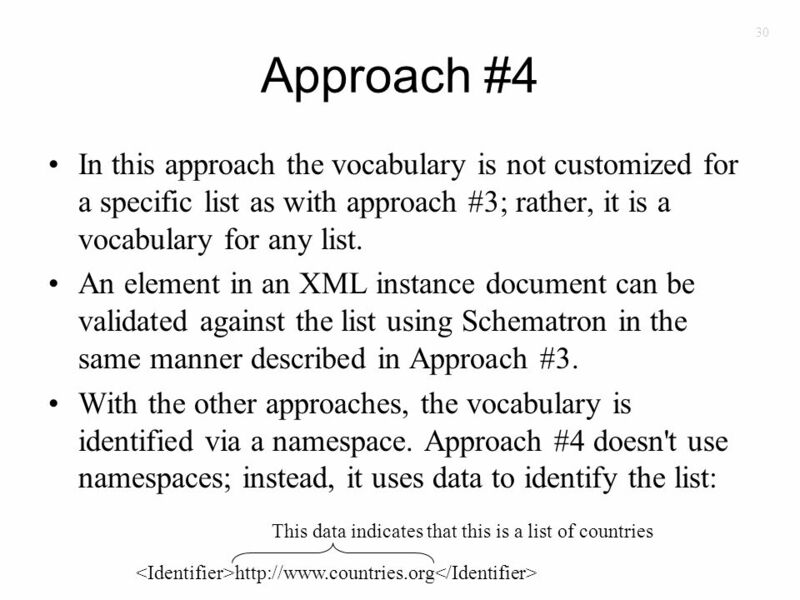 5 5 Example We will use a country list to illustrate the four approaches. 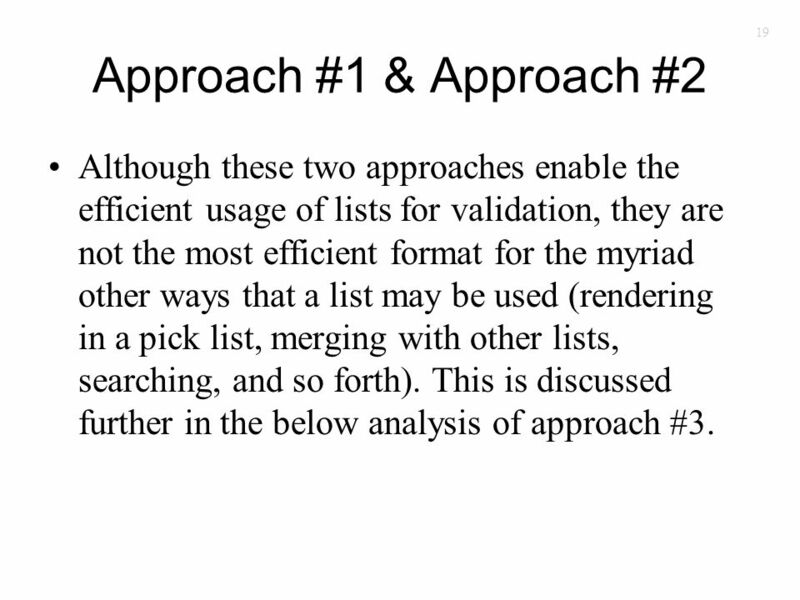 19 19 Approach #1 & Approach #2 Although these two approaches enable the efficient usage of lists for validation, they are not the most efficient format for the myriad other ways that a list may be used (rendering in a pick list, merging with other lists, searching, and so forth). 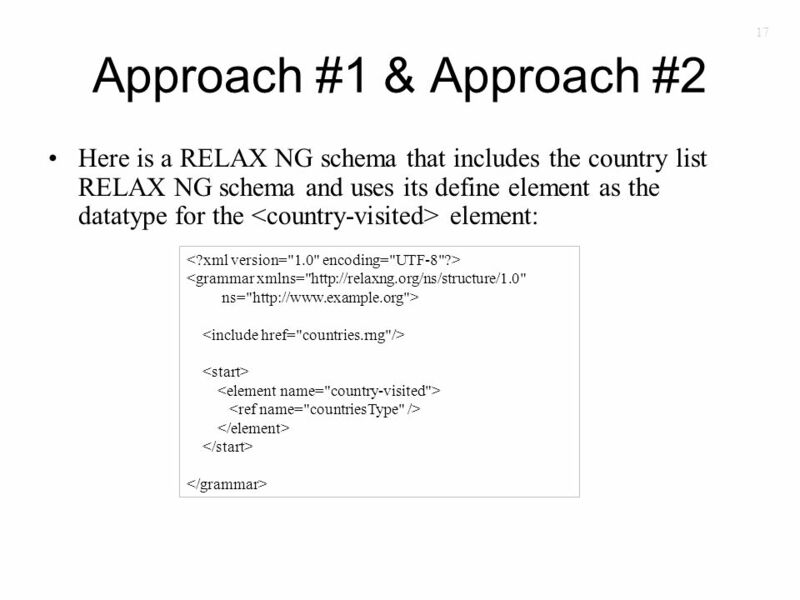 This is discussed further in the below analysis of approach #3. 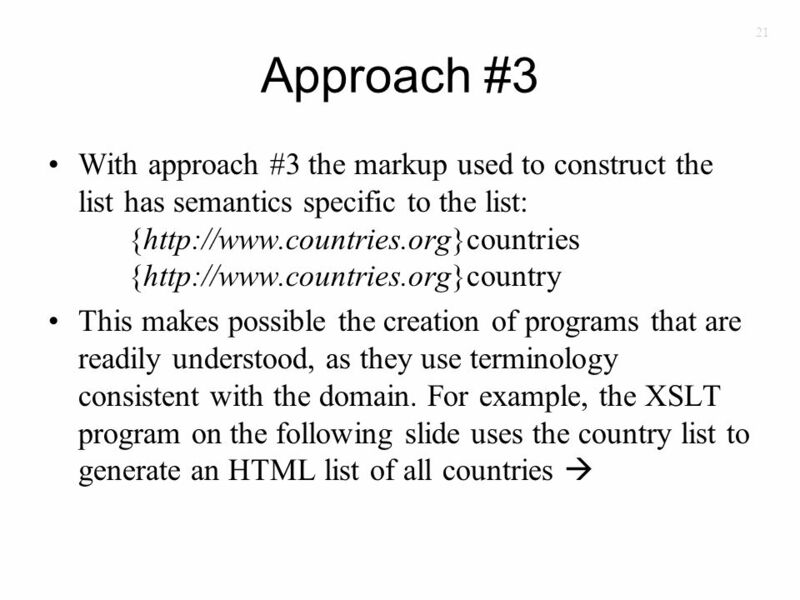 20 20 Approach #3 Recall that approach #3 uses domain-specific terminology. 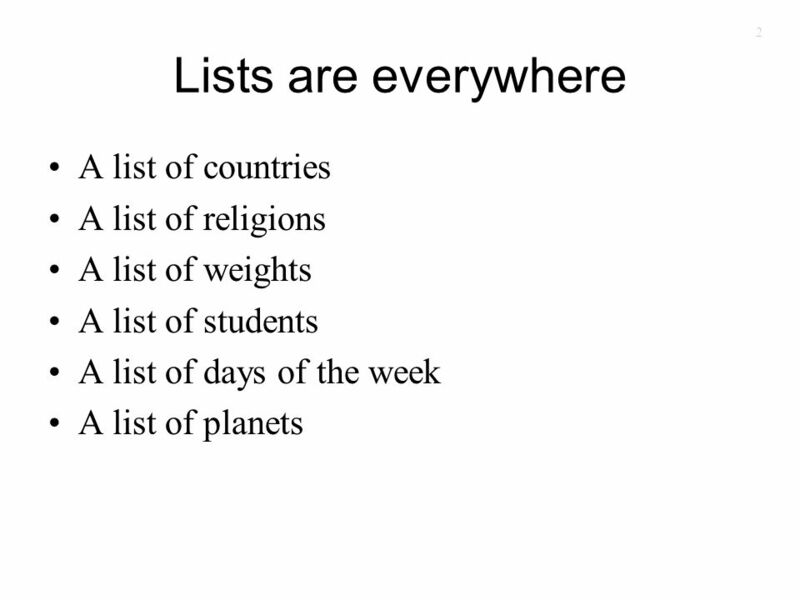 This can be helpful to Subject Matter Experts (SMEs) as they maintain the lists. 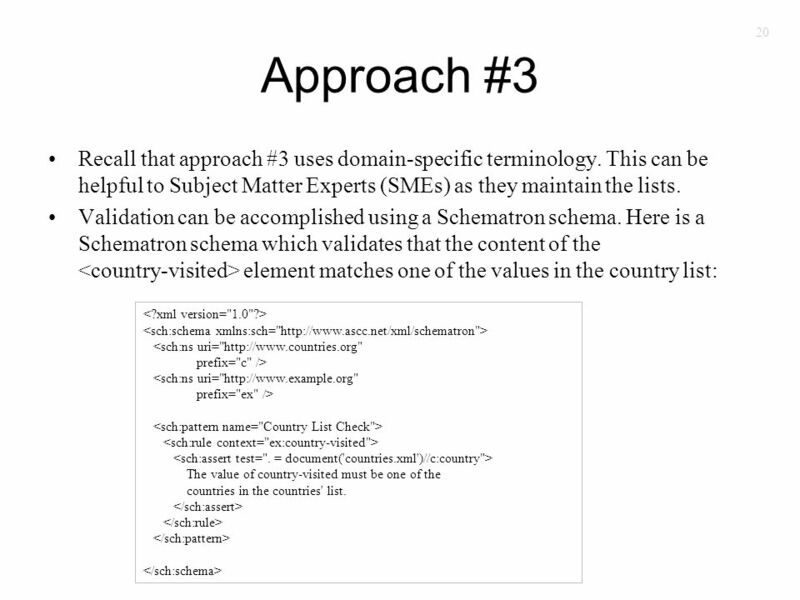 Validation can be accomplished using a Schematron schema. 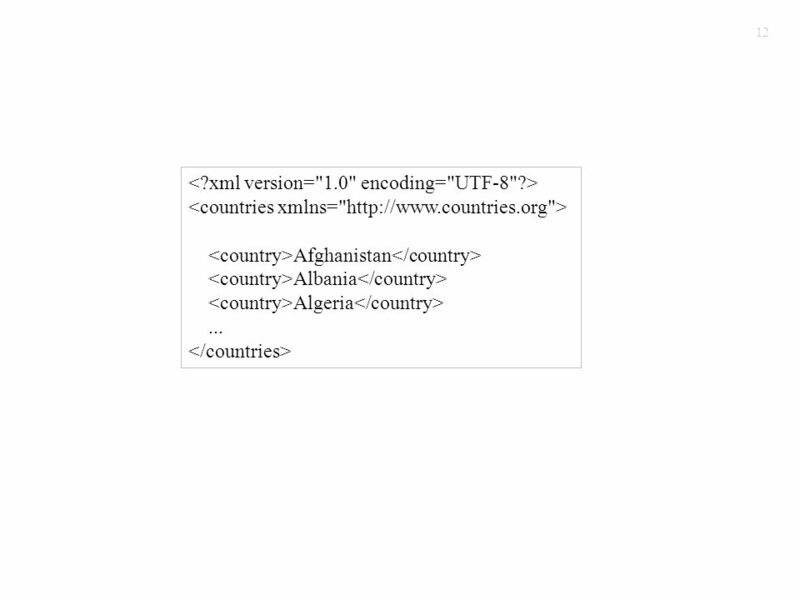 Here is a Schematron schema which validates that the content of the element matches one of the values in the country list: <sch:ns uri="http://www.countries.org" prefix="c" /> <sch:ns uri="http://www.example.org" prefix="ex" /> The value of country-visited must be one of the countries in the countries' list. 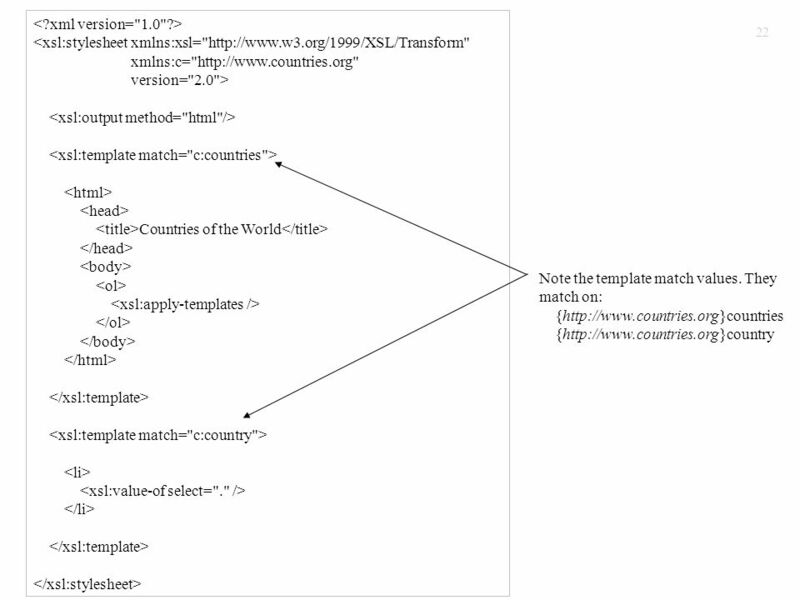 24 24 <xsl:stylesheet xmlns:xsl="http://www.w3.org/1999/XSL/Transform" xmlns:xs="http://www.w3.org/2001/XMLSchema" version="2.0"> Countries of the World Note the template match values. 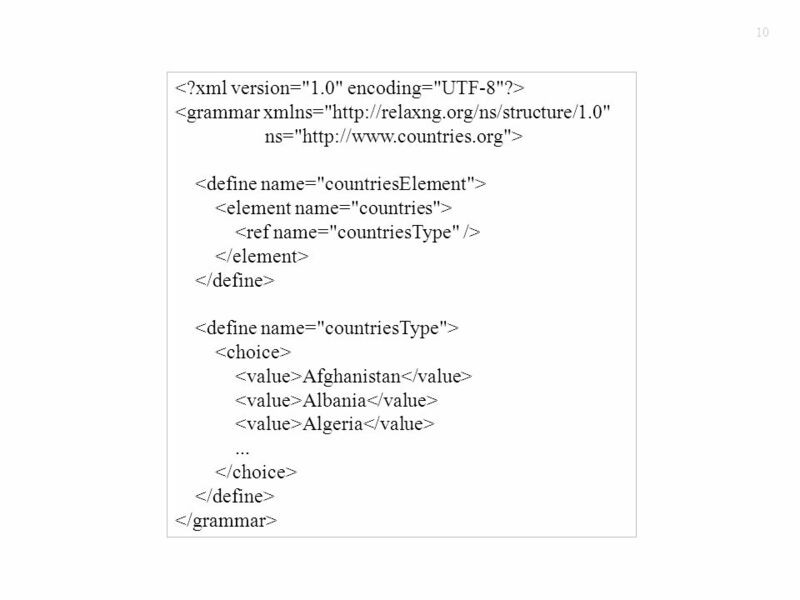 Rather than the XSLT program operating on and elements, it operates on,,, and elements. 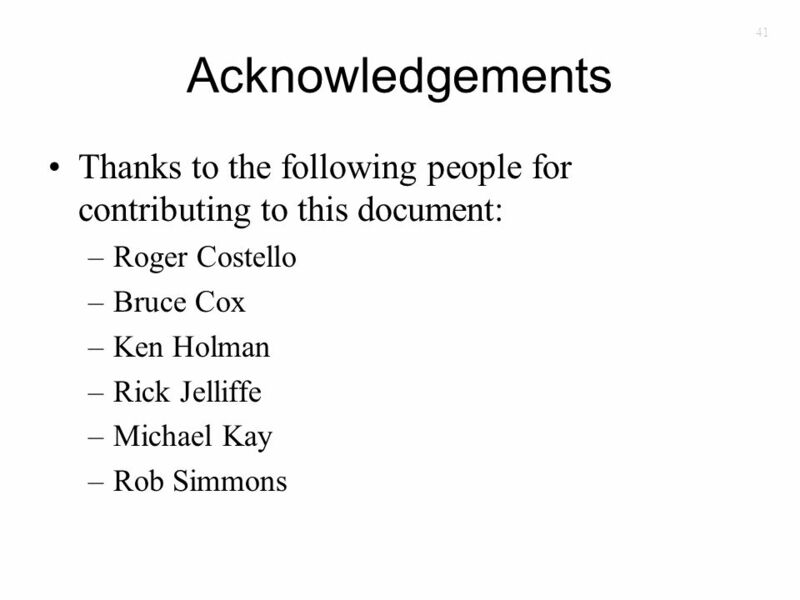 This makes programming challenging and error-prone. 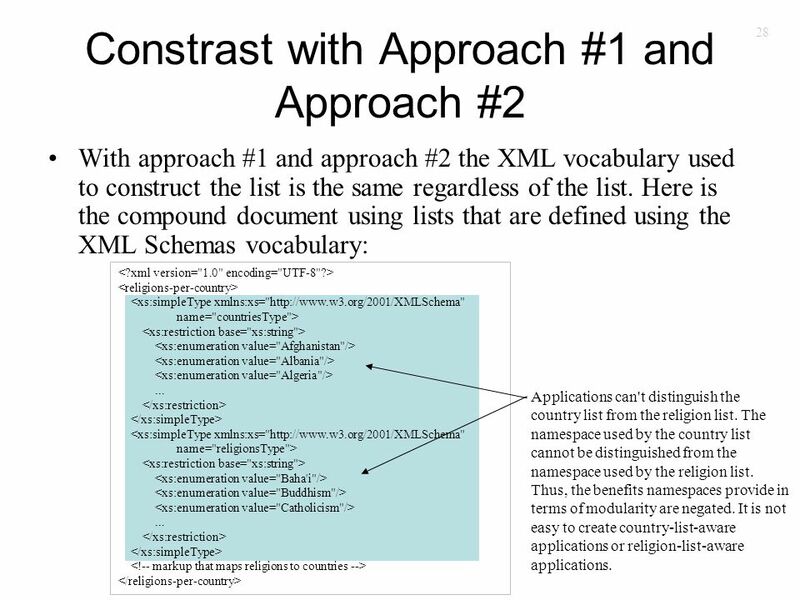 28 28 Constrast with Approach #1 and Approach #2 With approach #1 and approach #2 the XML vocabulary used to construct the list is the same regardless of the list. 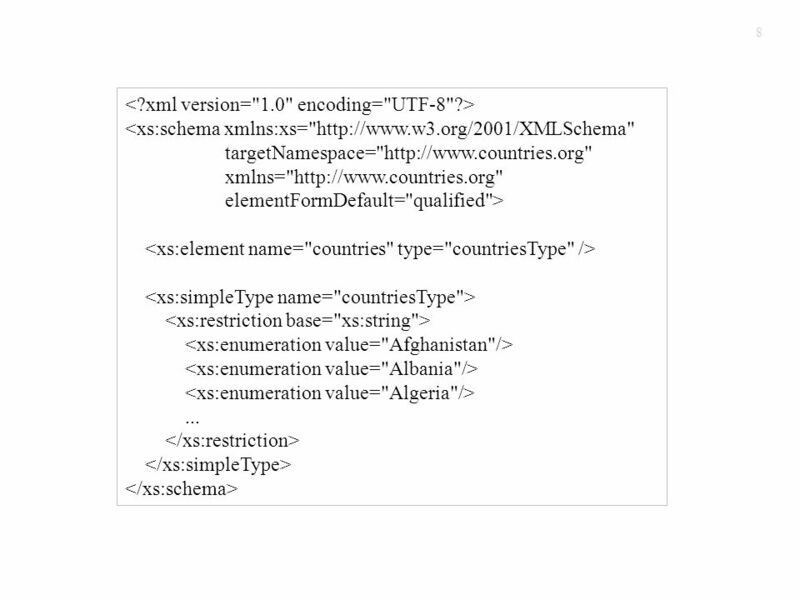 Here is the compound document using lists that are defined using the XML Schemas vocabulary: <xs:simpleType xmlns:xs="http://www.w3.org/2001/XMLSchema" name="countriesType">... <xs:simpleType xmlns:xs="http://www.w3.org/2001/XMLSchema" name="religionsType">... 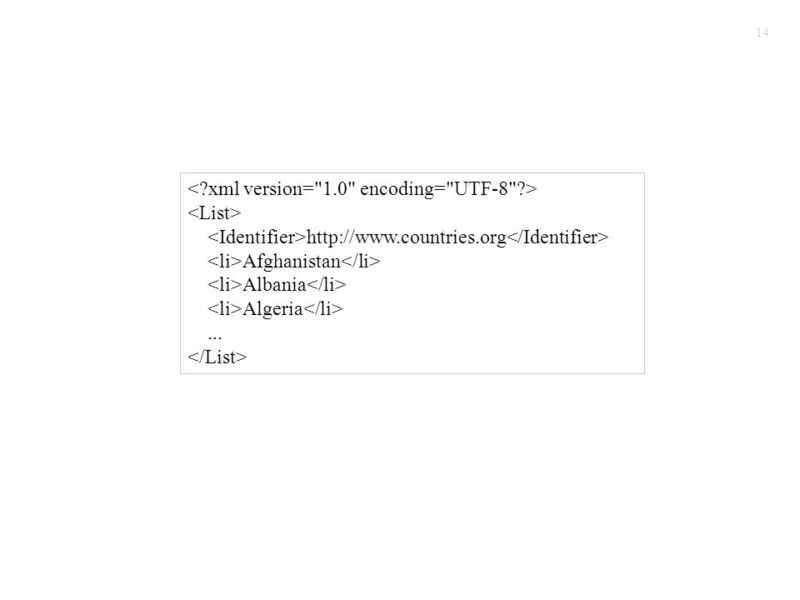 Applications can't distinguish the country list from the religion list. 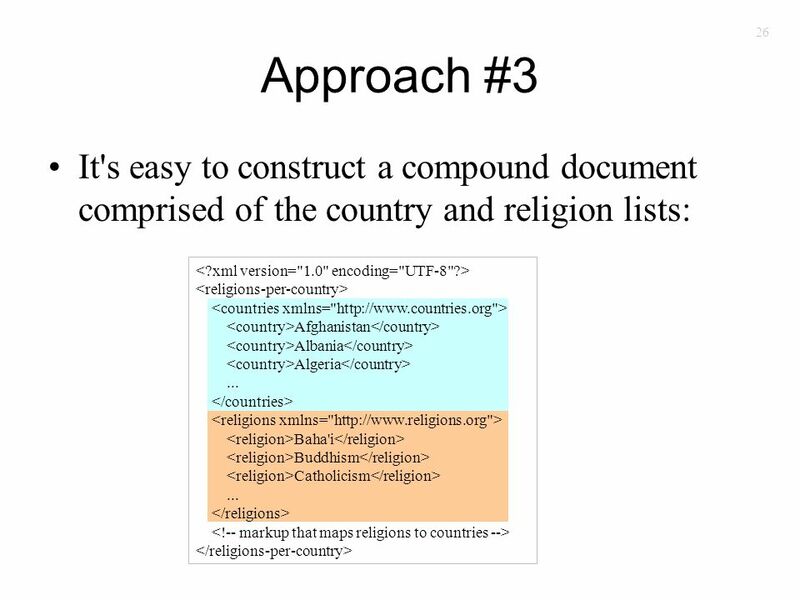 The namespace used by the country list cannot be distinguished from the namespace used by the religion list. 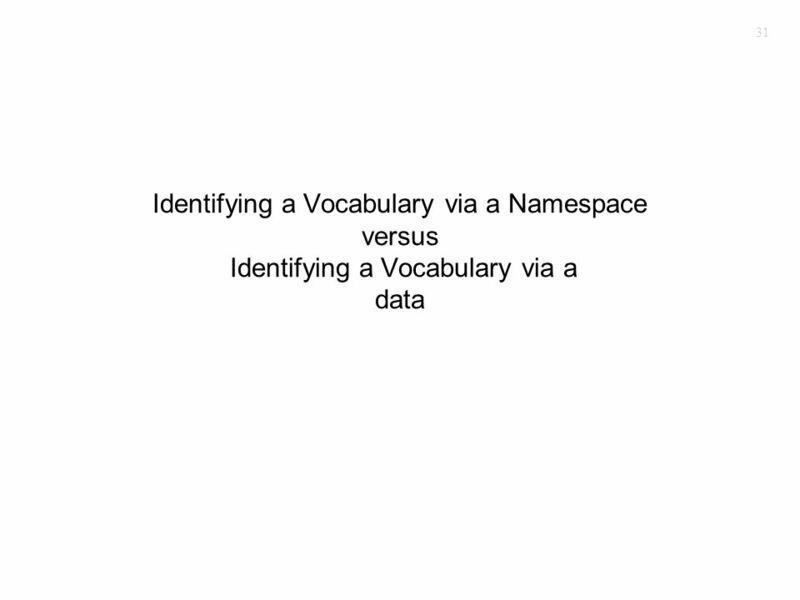 Thus, the benefits namespaces provide in terms of modularity are negated. 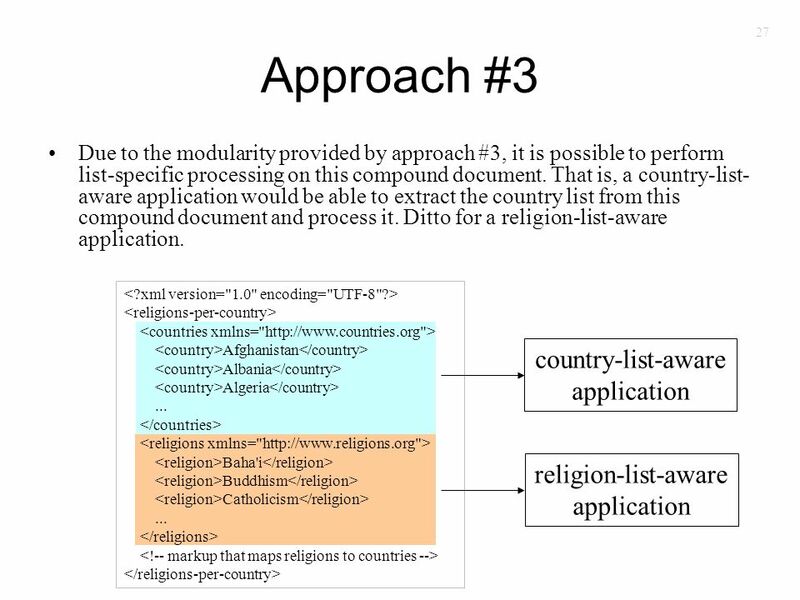 It is not easy to create country-list-aware applications or religion-list-aware applications. 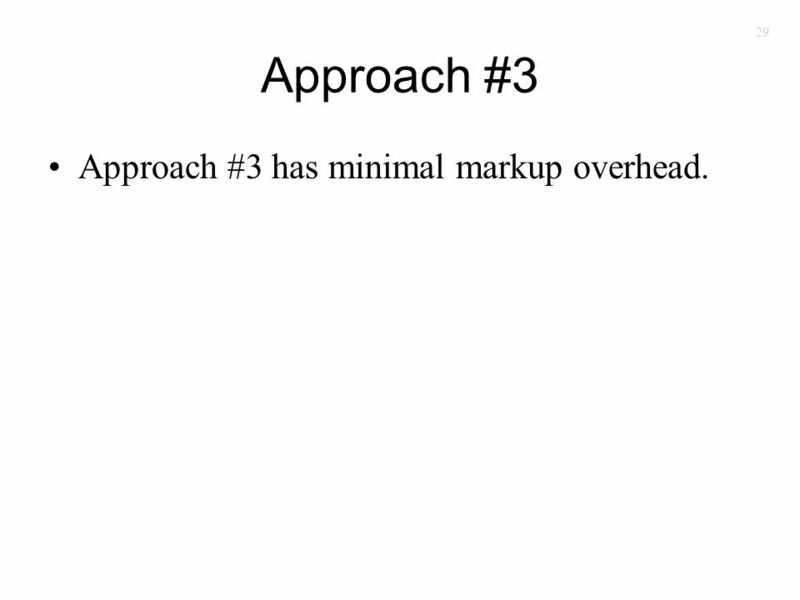 29 29 Approach #3 Approach #3 has minimal markup overhead. 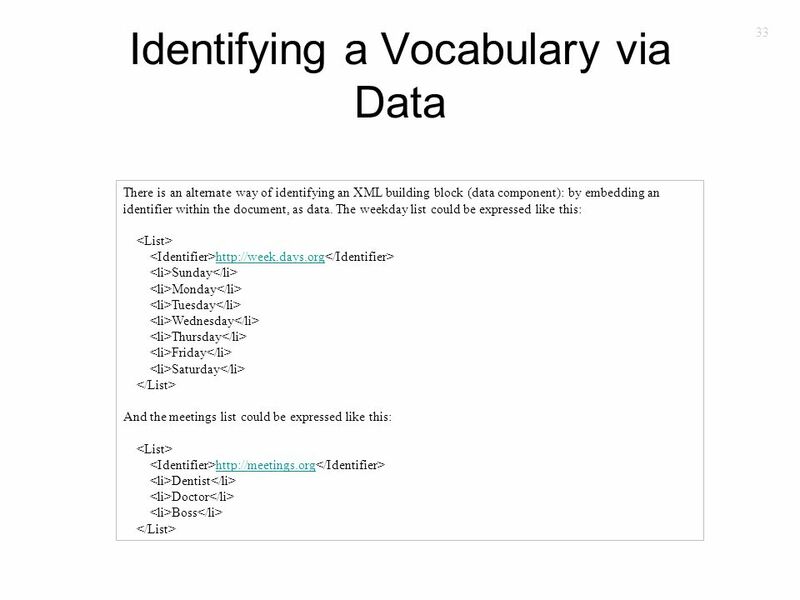 32 32 Identifying a Vocabulary via a Namespace One way of identifying an XML building block (data component) is by namespace. 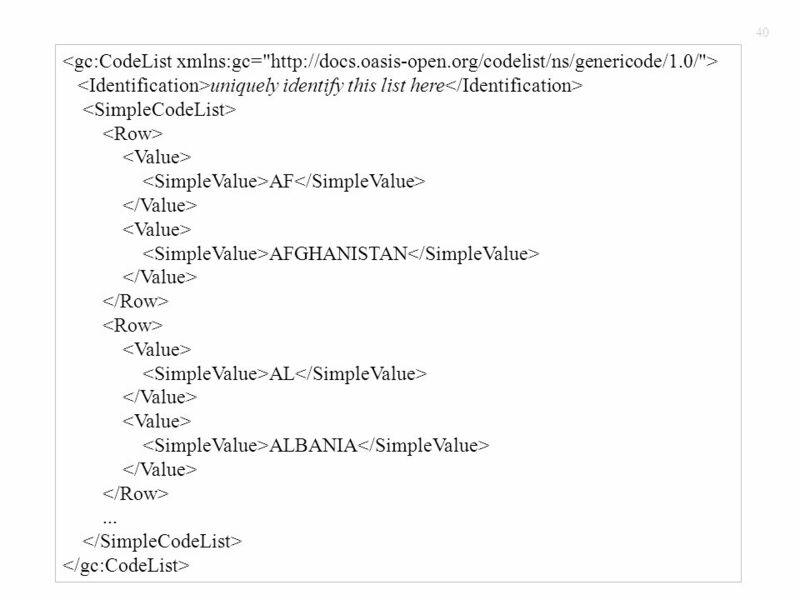 For example, this list component is identified by the namespace http://week.days.orghttp://week.days.org http://week.days.org Sunday Monday Tuesday Wednesday Thursday Friday Saturday This list is identified by the namespace http://meetings.orghttp://meetings.org http://meetings.org Dentist Doctor Boss Applications can be built that are namespace-aware. 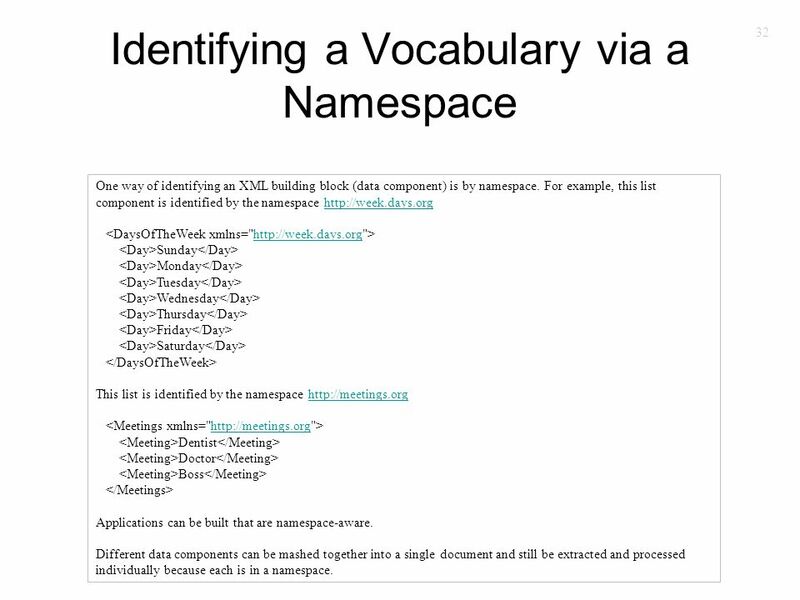 Different data components can be mashed together into a single document and still be extracted and processed individually because each is in a namespace. 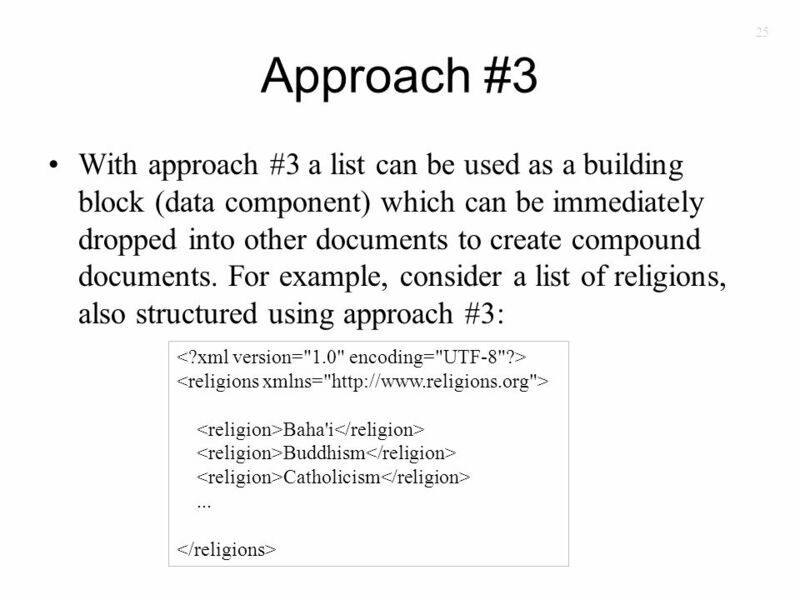 35 35 Analysis The namespace approach has the benefit of being widely adopted. 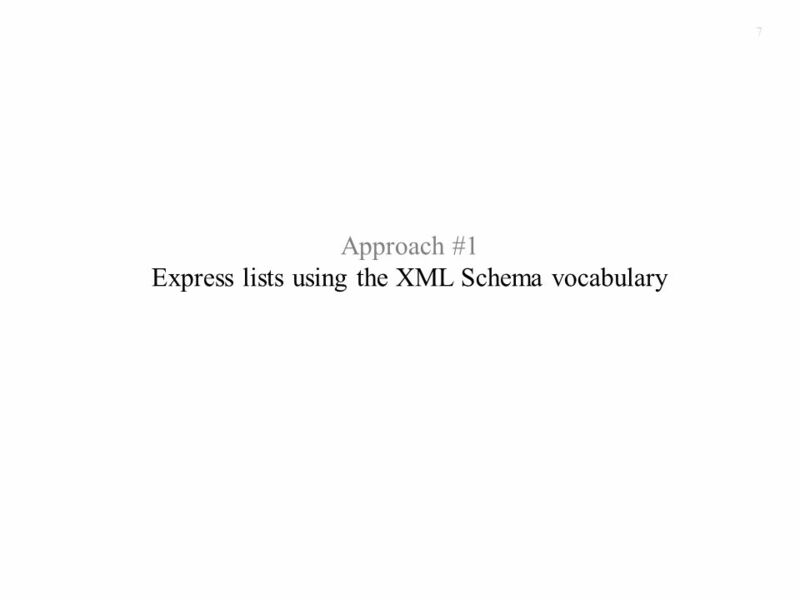 Most XML tools, parsers, and technologies are based on namespaces. 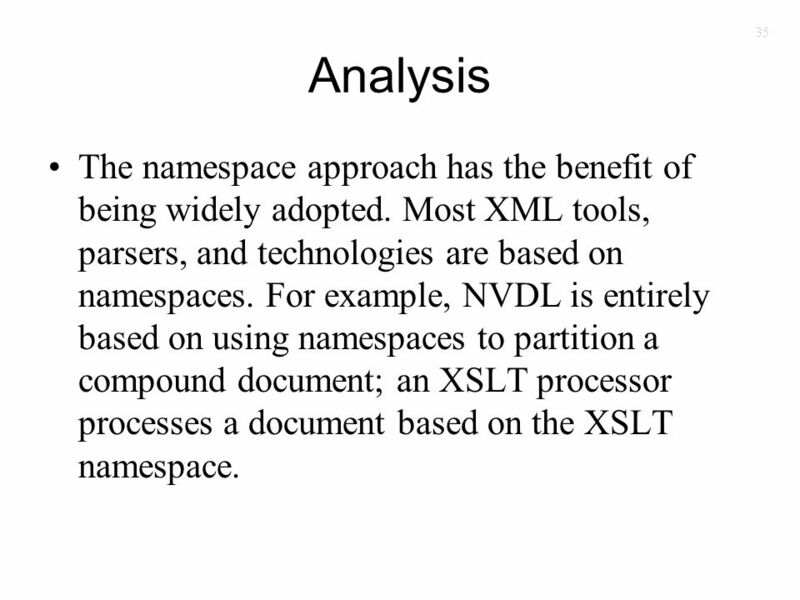 For example, NVDL is entirely based on using namespaces to partition a compound document; an XSLT processor processes a document based on the XSLT namespace. 36 36 Cont. 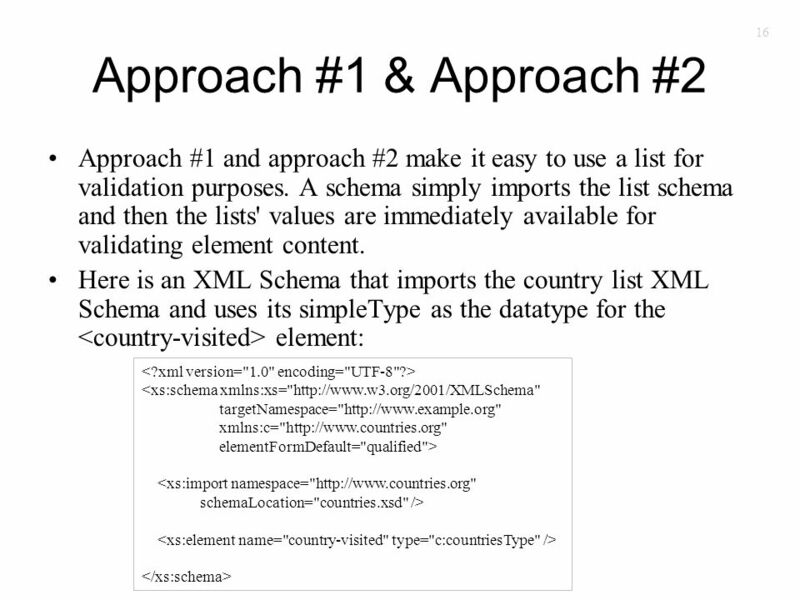 By using data to identify a list (rather than namespaces) the same XML vocabulary can be used for all lists which makes all list-processing algorithms and code independent of the content, allowing one to leverage a single investment in software and access all code lists. 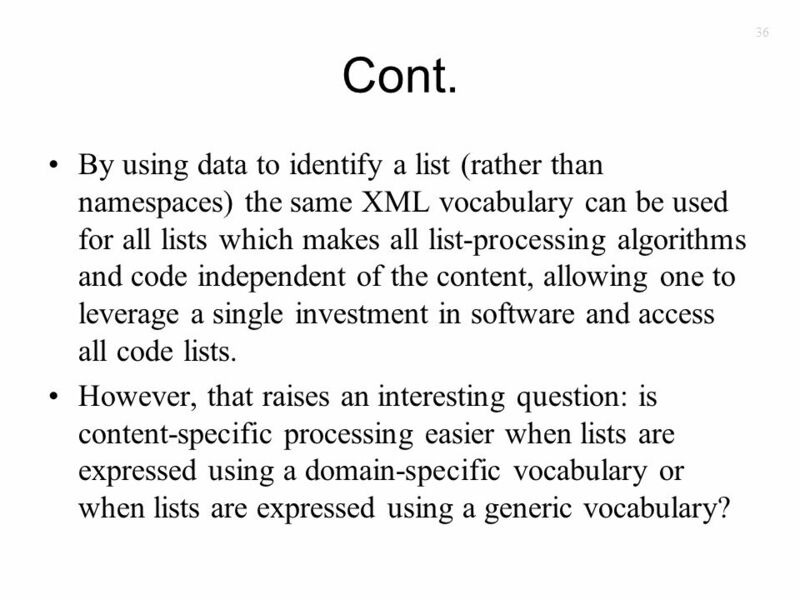 However, that raises an interesting question: is content-specific processing easier when lists are expressed using a domain-specific vocabulary or when lists are expressed using a generic vocabulary? 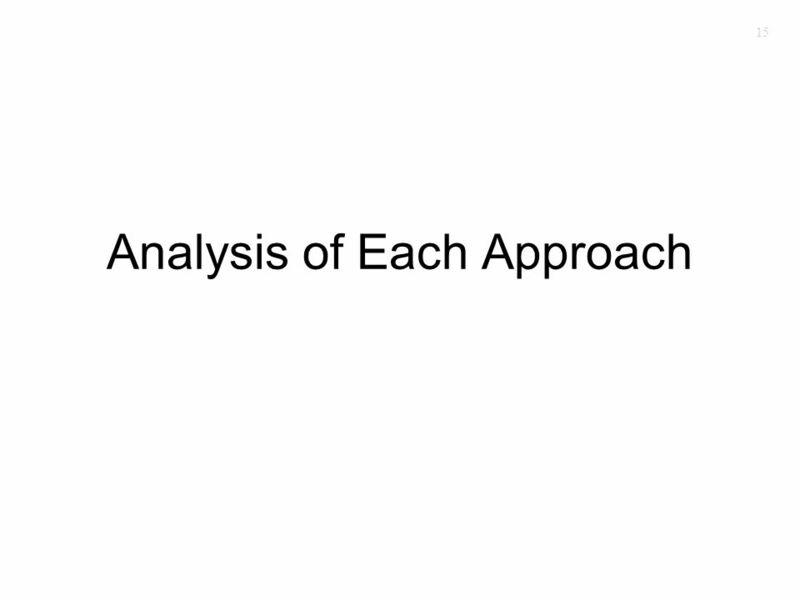 37 37 Analysis of all Approaches Regardless of which approach is used, the meaning of the list and its values must be clearly documented. 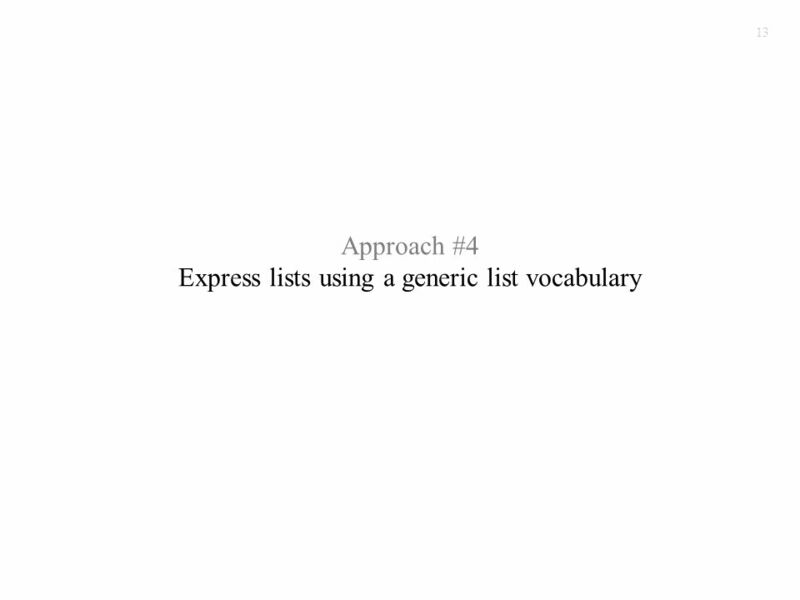 It may be challenging to achieve consensus on meaning: –The same terminology may be used by different people to mean the same thing. 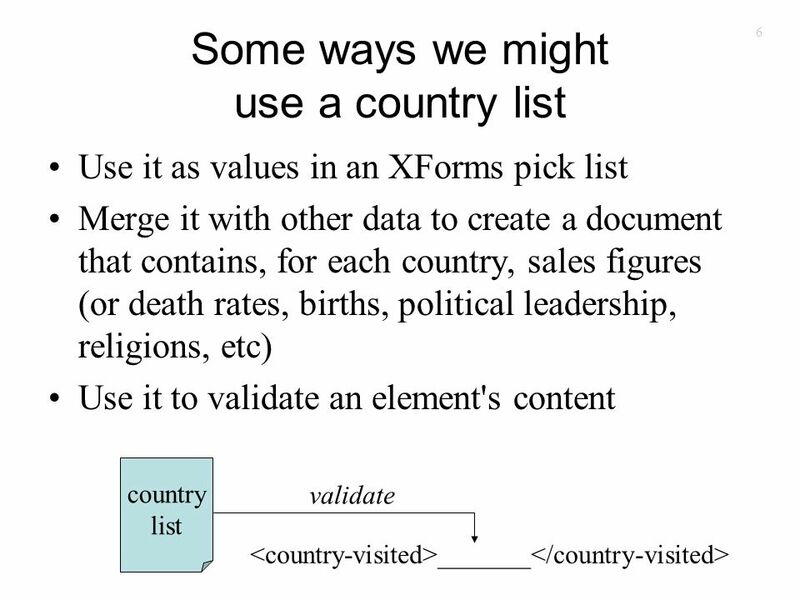 For example, one person expects to see Puerto Rico in a country list, whereas another person does not. 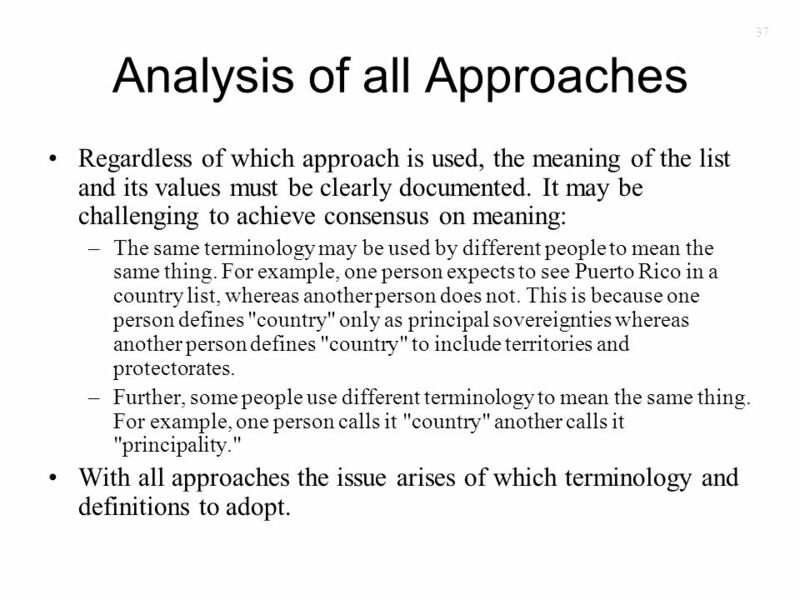 This is because one person defines "country" only as principal sovereignties whereas another person defines "country" to include territories and protectorates. –Further, some people use different terminology to mean the same thing. 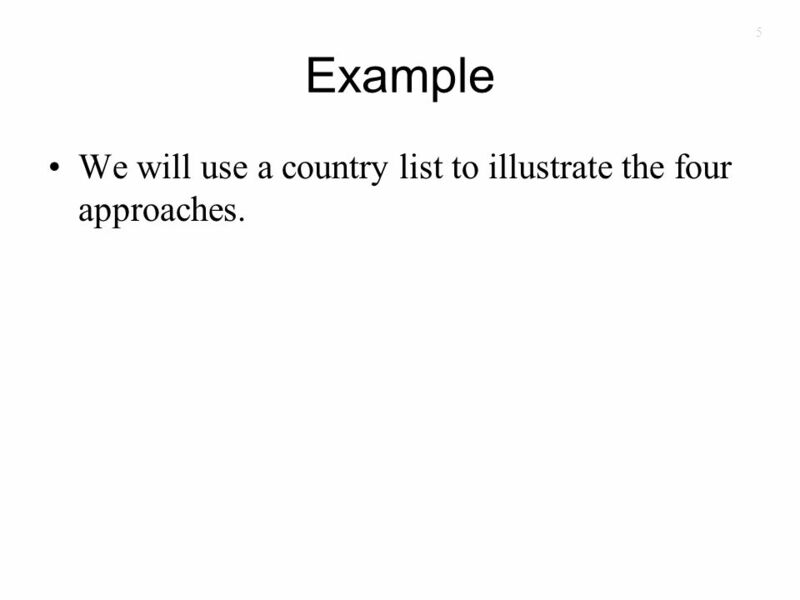 For example, one person calls it "country" another calls it "principality." 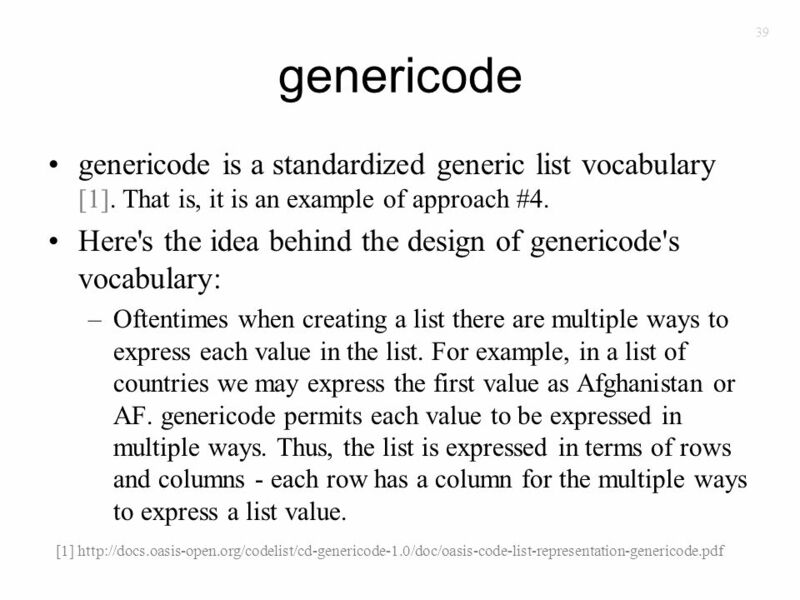 With all approaches the issue arises of which terminology and definitions to adopt. 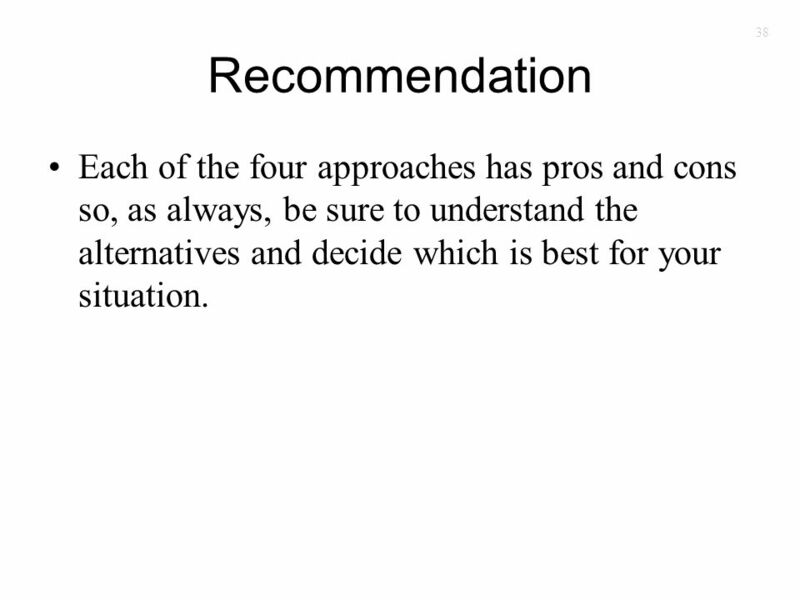 38 38 Recommendation Each of the four approaches has pros and cons so, as always, be sure to understand the alternatives and decide which is best for your situation. 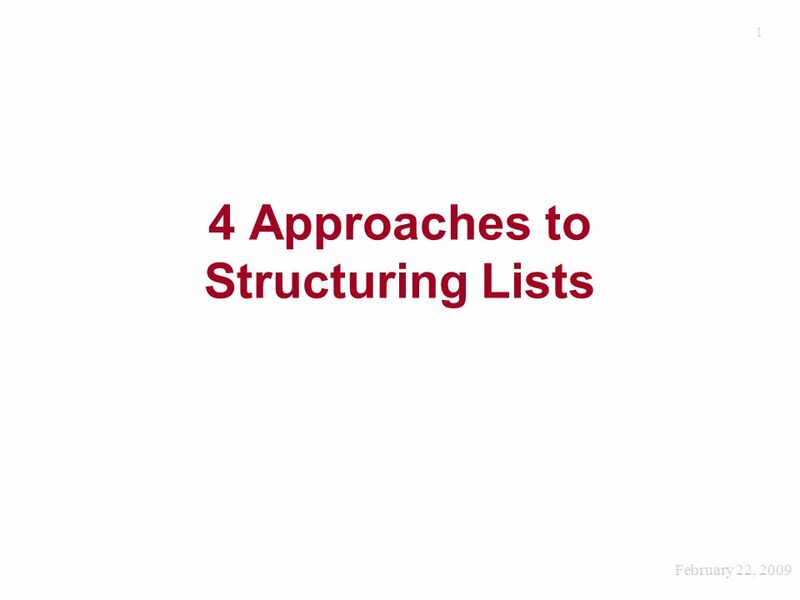 Download ppt "1 4 Approaches to Structuring Lists February 22, 2009." 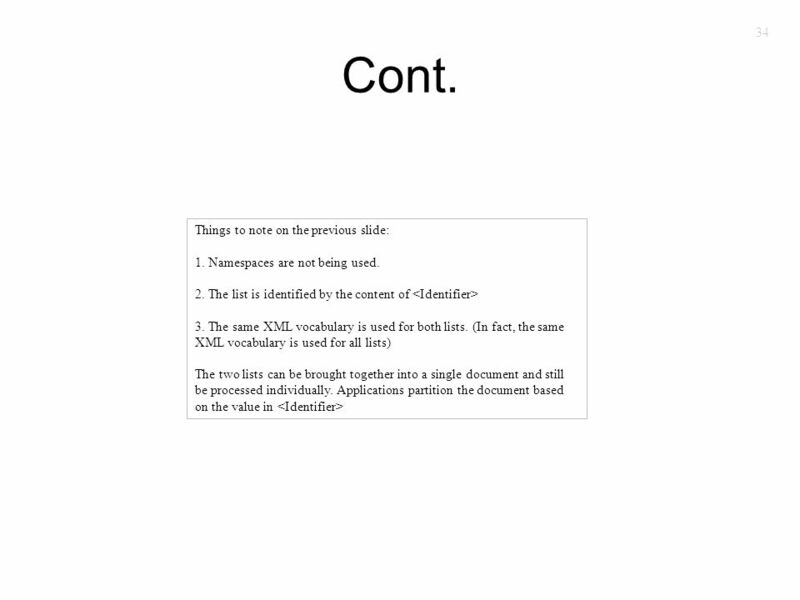 1 Example Constraint Between Components Consider an XML instance document that has two parts: 1.The "what" part describes - using a standard taxonomy. 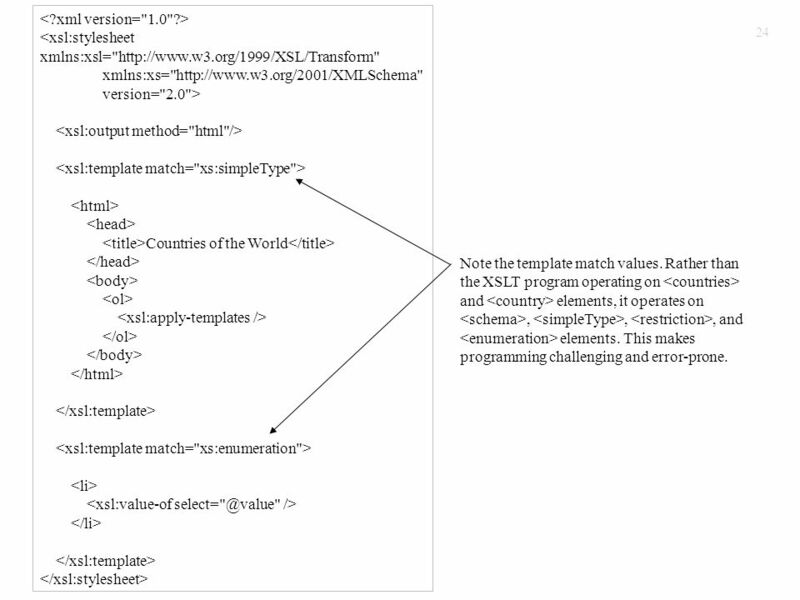 1 Rules of Thumb for Creating XML Vocabularies for Workflow Applications February 1, 2009.